12-01-14 – Sometimes you need to reboot your brain, blink your eyes and forget what you know, stop accepting the world you see and see the world that’s off the map. It helps when you meet clients who know what they don’t want: a perfunctory landscape similar to every other in their neighborhood. 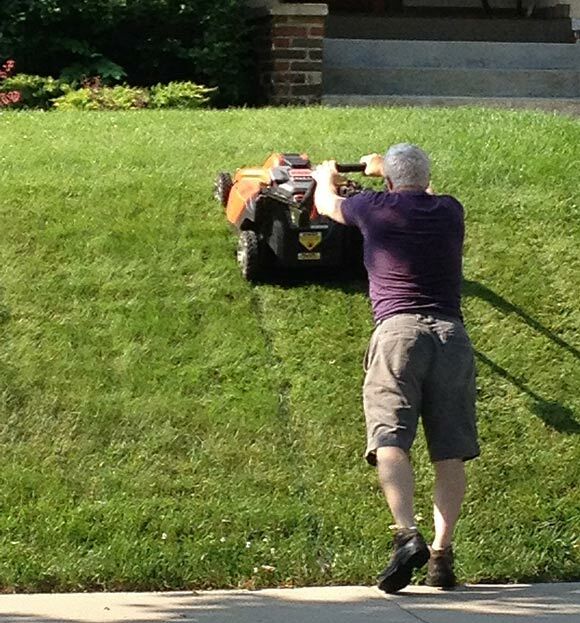 Peter hated grass, for two very good reasons – he hated mowing it and was allergic to it once cut. Andrew wanted something “different” and had only one plant request, the spring flowering and edible fruiting dogwood, Cornus mas (Cornelian Cherry), which reminded him of his years living in Maryland, where the plant abounds. They had lived in the eastern and western US, and had recently moved to St. Paul, Minnesota from southern California. 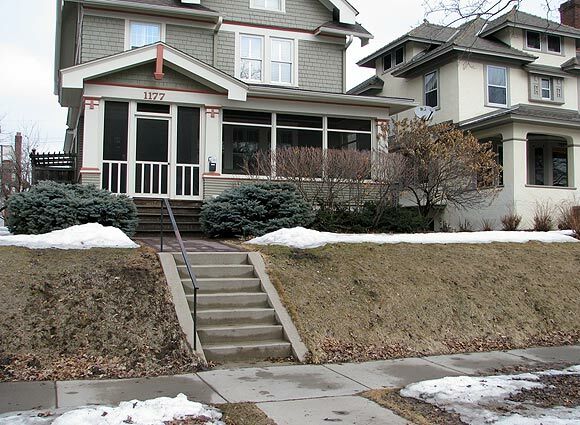 Their charming, well maintained, 1930s Craftsman Bungalow sat on a standard rectangular city lot. We had landscaped the front yard the previous year (I’ll include some photos at the end of this) and now set out to completely renovate the back yard. Our blank canvas, looking from the house to the garage. It needed it. What existed as we loaded in the Bobcat, wheelbarrows and hand tools (luckily, alley access) was a back yard bounded on the south by the house and attractive poured concrete patio, long wood privacy fences on each property line east and west, capped to the north by a detached garage and final fence section. A typical layout of most city lots, and in fact identical to every house on their block and surrounding blocks. 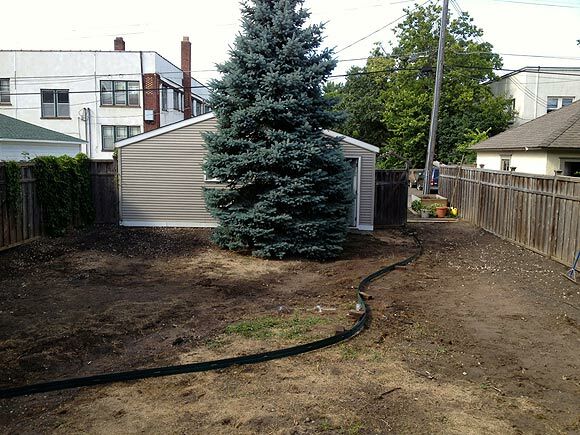 Ninety percent of the rectangular space was lawn. A mild collection of desperately unhappy shrubs lined the perimeter fences here and there, old red-twig dogwoods mostly, a few yellow-twig, a wheezing juniper tossed in the corner for the hell of it. A good-looking, twenty-year-old Colorado blue spruce held its ground dead center along the back perimeter. We tore out everything except the spruce. 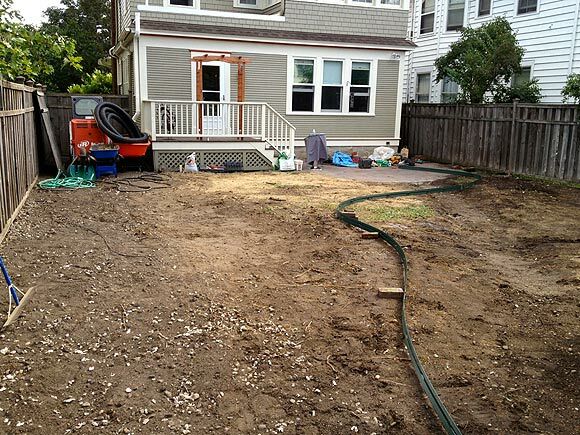 When we were finished, I had seen vacant lots with more character. The view from back to front. The aluminum edging is being used to find the line for the stone sidewalk. Now all I had to do was design something. 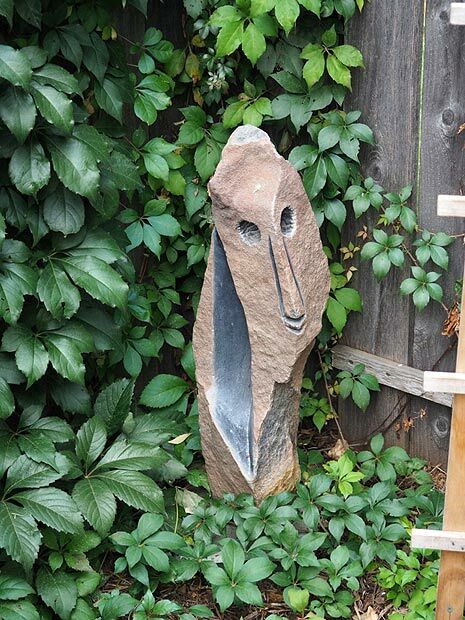 The clients had acquired some beautiful garden sculpture in their travels, enjoyed and appreciated the arts, so were looking for a design and plants that would create a landscape more like a private arboretum than a typical city back yard. They liked and used their small patio for dining, so wanted a special view from there. Kitchen windows looked out, elevated, to the entire back yard, so from that view the entire landscape needed to change, surprise, roll and rumble. They wanted a private seating spot with bistro table in which to relax with a glass of wine. They wanted a small area to grow vegetables in raised beds. Peter wanted a pond to grow lilies, and Andrew wanted his Cornus mas. Pretty simple design solution, really: A collection of garden rooms. As close as I came to drawing a plan. Too detailed a plan stifles creativity. Garden rooms are a great way to landscape virtually any size back yard, if you love plants, love the idea of myriad views and surprises at every turn, and want a landscape that cannot possibly look like anyone else’s. 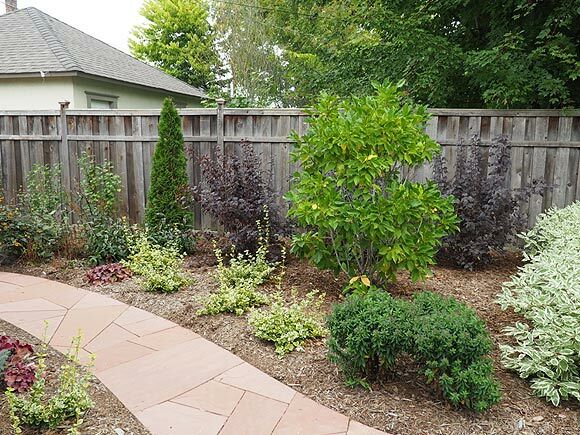 The walls or perimeter of each room are created either by hardscape – sidewalk, pathway, walls, fencing – or plant material, typically in the form of hedges. Each room should serve a purpose, aesthetic, utilitarian, or both. 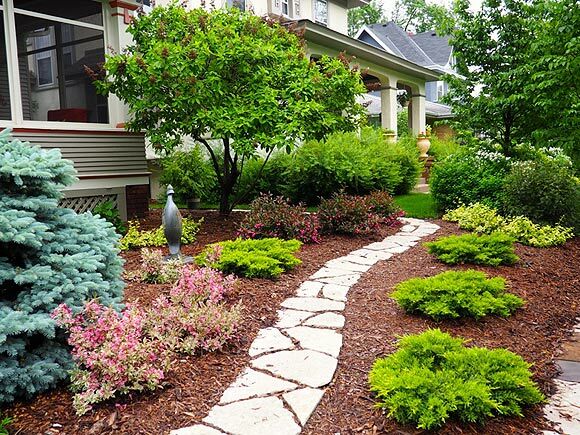 Lawn is one suitable flooring material for rooms, if desired. Each room should feature plant material unique to the room, though some overlap of plant material is perfectly acceptable. The number of rooms is up to you, though a room less than one hundred square feet strikes me as too small. The red sidewalk creates a vibrant serpentine slash that serves as the hallmark of the landscape, and is the only feature bordering each room. I divided the back yard into five rooms of unequal size. A curving stone sidewalk made from Colorado red flagstone (the poured concrete patio was tinted red) runs the length, north to south, from the garage to the patio and house. Running east to west across the middle is a curving hedge of Ivory Halo dogwood (Cornus alba ‘Bailhalo’). Because the yard was flat, we would plant this hedge on a curving berm to give it added height, and add some swale to the middle of the yard. That’s four rooms. The fifth room was created by moving the short section of back perimeter fence from the front of the detached garage to the rear (Peter’s suggestion), thus creating a small rectangular area at the back the perfect size for three raised vegetable troughs that would encounter all day sun. Room 1 is the largest of the five, it adjoins the house and patio, is the first thing you see when you walk out the back door onto the small deck, and it had to be special. 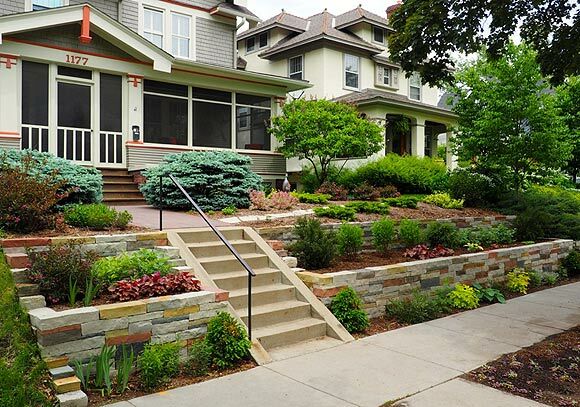 I always tell readers, steal with your eyes, and while I’m not a huge fan of the austere west coast modern style of landscape design, grid plantings of grasses I’ve noted elsewhere in the country do have a serene yet commanding presence. Put another way, they just look cool. 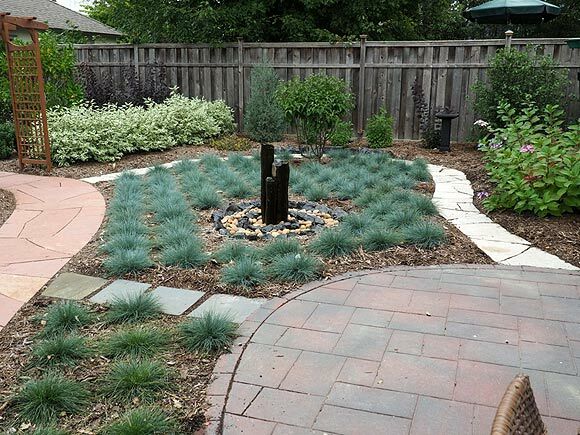 For the grid grasses I used Festuca glauca ‘Elijah Blue’ for its dwarf size (8” x 8”), tufted shape, and because it’s blue, which bounces off the red sidewalk and white perimeter pathway. 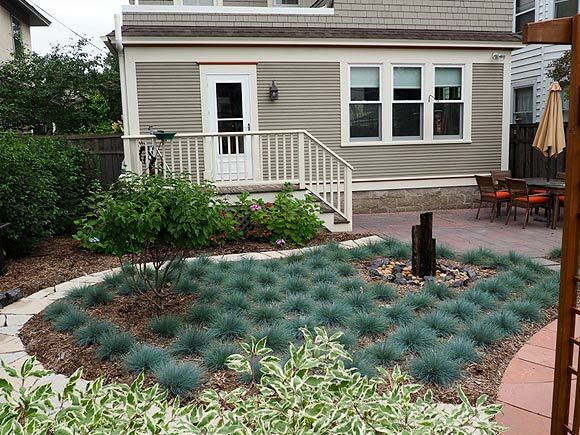 The only two objects interrupting the grid are a basalt column fountain (directions on how to install one, click here) and the showcase plant, Cornus mas. 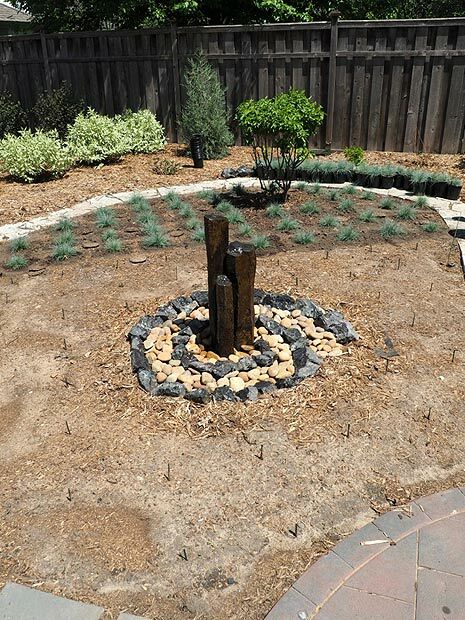 The clients feed birds, the main birdfeeder located in adjacent Room 2, so a formal style, black concrete birdbath is situated on the perimeter off the grid to encourage bird traffic across the yard from feeder to water supply. To plant on a grid, use long, straight boards or taut strings and a tape measure, placing a small stake for each plant in the grid. 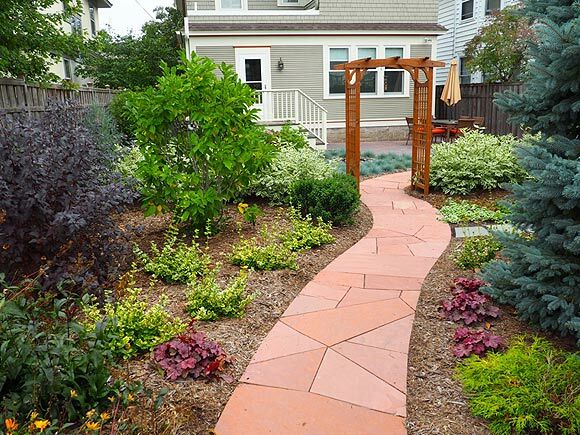 A curving Fond du Lac stepping stone pathway runs along the perimeter of the grass grid, to offer access to the birdfeeder and the perimeter and interior shrubs for maintenance, as well as access to pick the summer fruits of Cornus mas. I wanted one more formal design element, so used twelve-inch Black Ice quartzite boulders along the outside of the pathway as a collar to the view of Cornus mas from the patio. I probably wanted one of the rooms to be a conifer garden more than the clients (in fact, I’m sure I did), but they cheerfully went along. A conifer garden is simply a collection of individual, unique plants with leaves in needle form, presented as if in a museum gallery. They need not all be true conifers, that is, cone producing, unless you so choose. Remember, this landscape is in Minnesota, and needs to have interest in winter, and that is when these evergreens will most stand out. It is the smallest room, sitting directly across the red stone sidewalk from the grass grid, so there is very stark contrast between the rooms. It takes a while for a conifer garden to fill in, five years before the varying shapes, sizes, textures and colors of each evergreen begin to form a single painting, and ten years before they begin to mature (the fence will only partially be seen), but the room was fascinating to study the day we planted it, and will only get better. 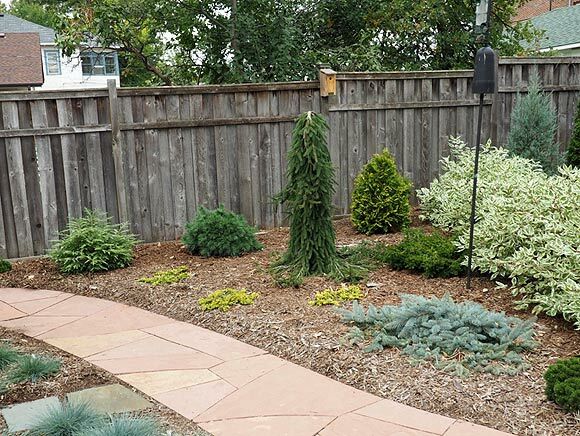 The plants in this collection are: Taxus cuspidata ‘Nana Aurescens’ (Yew); Tsuga canadensis ‘Moon Frost’ (Hemlock); Pinus strobus ‘Blue Shag’ (Pine); Thuja occidentalis ‘Yellow Ribbon’ (Arborvitae); Picea abies ‘Pendula’ (Spruce); Taxus cuspidata ‘Monloo’ (Yew); Juniperus horizontalis ‘Gold Strike’ (Juniper); Picea pungens ‘Procumbens’ (Spruce); Pinus mugo ‘Slowmound’ (Pine). 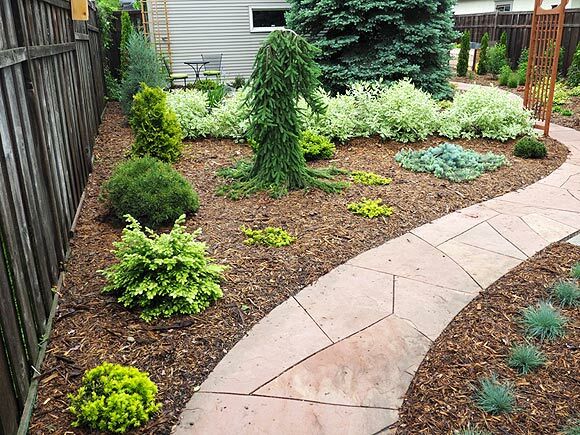 Next spring I need to dig up and redistribute the groundcovers to the left of the stone pathway – stonecrop sedums, lamium, ajuga – to create a more evenly colored quilt. This room combines multiple functions. First, being in the far left corner from the house, it offers privacy, a great spot for a small (35 sq. ft.) stone patio pad for the two-chair bistro set. Seated, you are gazing at the landscape from a unique view. And what would you like to be able to gaze at closely in this serene setting? The lily pond, which is situated along the edge of the small stone pad, and is actually four-fifths pond and one-fifth filtration bog, so Peter can grow both water lilies and some bog plants. The view from the seating area. 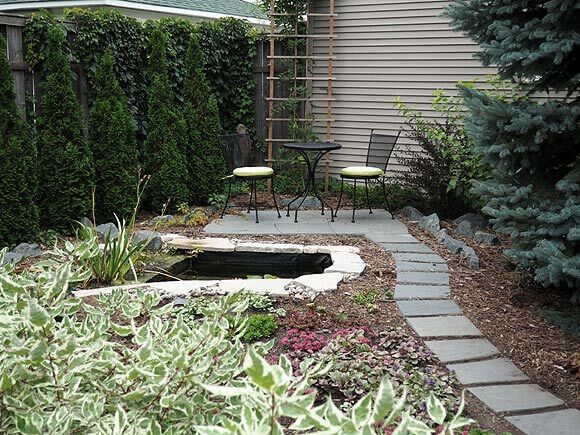 One enters Room 3 via a New York bluestone stepping stone path that exits off the main sidewalk, curves past the pond, along the side of the large blue Spruce, and ends at the stone pad and bistro seating area. Should have stopped by in May to get a photo of ‘Ricki’ in bloom. Apologies. Mag City is so named because its feature plant is Magnolia x ‘Ricki’, a dense, small tree (10’ H x 6’ W) with sensational, curved, reddish purple spring blooms. After blooming, as the leaves emerge, it’s stellar throughout the rest of the growing season, and has strong sculptural interest in winter. The room also serves as the deciduous shrub collection, featuring a variety of colorful, leafy shrubs. 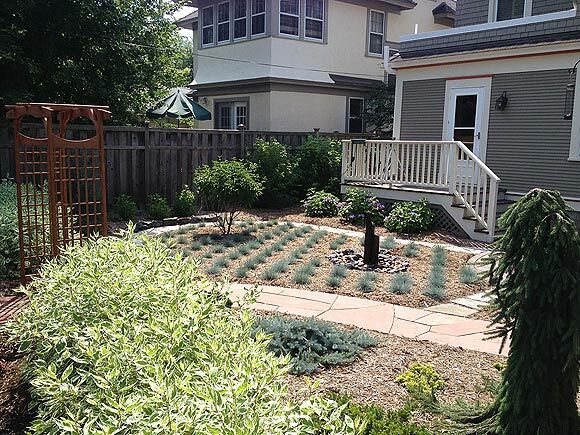 Near the end, as one proceeds down the stone sidewalk toward Room 5, is the perennial garden, visible only as you pass through the wood arbor. The red sidewalk turns to white steppingstones to mark one’s arrival at the country farm portion of the landscape. 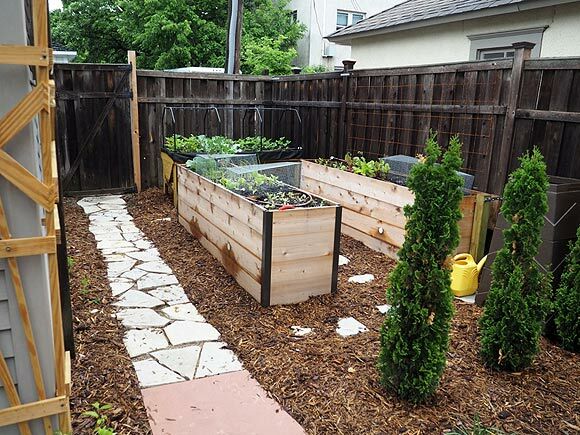 Tucked into the far right corner is the vegetable growing area, with small compost bin and three raised growing beds. It is screened from the other rooms by a hedge of three De Groot’s Spire Arborvitae. As it is the most utilitarian and least aesthetically pleasing room, it is tucked in the back where you don’t see it. Yes, it is the longest hike from the kitchen, but hey, nothing is perfect. 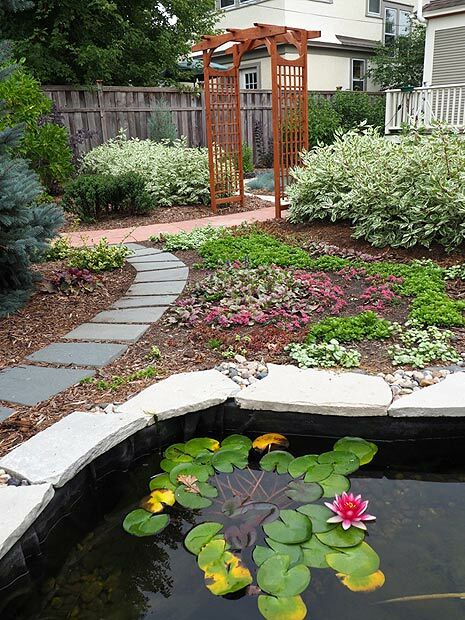 Notes to Don for next spring: The black birdbath needs a square Fond du Lac stone pedestal; plant the two Clematis on each side of the arbor; fix the groundcover quilt leading to the pond in Room 3. A landscape, you see, is similar to a Stanley Kubrick film; the director is never quite finished tweaking the final product. Any theme you can dream makes a great garden room. A room could be a Japanese-style garden; an English formal garden with statues, topiary and symmetrical plantings; a patio or bench area; an outdoor office; a water garden; a stone garden featuring a boulder fountain; a conifer garden; a perennial garden; a color-theme garden; a fairy or miniature garden; a vegetable garden; a children’s garden; a sculpture garden; a sunken meditation garden; a boulder outcropping garden. The list is endless. This is the front yard when I first pulled up in April, 2012. This is an identical lot across the street. Why a person would do this rather than terrace the hill is beyond me. This is what I designed and installed with my crew. The clients wanted something no one else had. OK.
Here’s the front yard above the terraced hill, formerly lawn. The only plants we retained were the two dwarf blue spruce and the hydrangea tree.